I hope everyone had a great holiday season. I had a really fun New Year’s Eve. I took my staff Annie to First Night Worcester which I go every year. Despite the cold we had a great time with listening to a teenage singer, watching fireworks and seeing the incredible “Mind Reading” performance. Then I finished up cooking in the morning of New Year Day to have people to celebrate New Year with the traditional Japanese “Osechi” meal together. Since my family used to make this dish every year, I learned to do it. I felt grateful to have good friends and family to celebrate New Year this way together. In my kitchen which is also a dining space I had a rug that I had woven in the end of 2013. 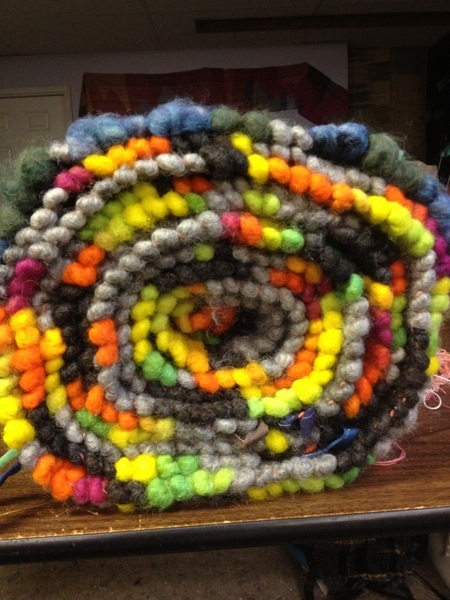 I bought the”Core Spun Rug Yarn” at Fiber Festival of New England back in Nov. having this project in mind. Although I was not sure how much yarn I would need, I got 3 bright color wool/mohair yarn(100 yards each), 2 gray wool yarn (75 yards each) and 1 brown wool (75 yards). I ended up using them all. I set up 7 meter warp and full width (60 cm), used 6/2 and 8/s cotton for warp and used a 2 dents/cm reed. 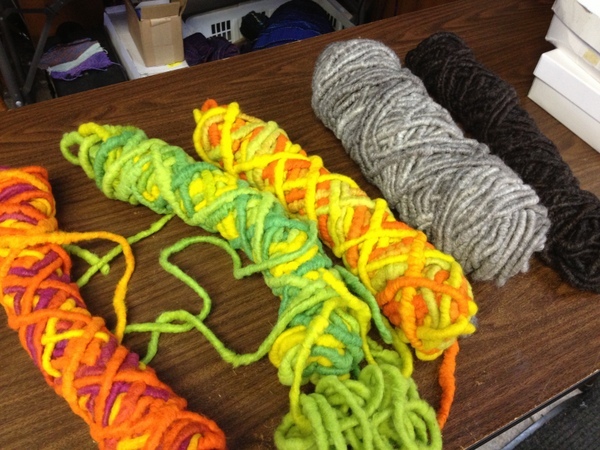 I had to use a stick shuttle to wind the thick core spun yarn. It was dynamic movement to make the progress easily. 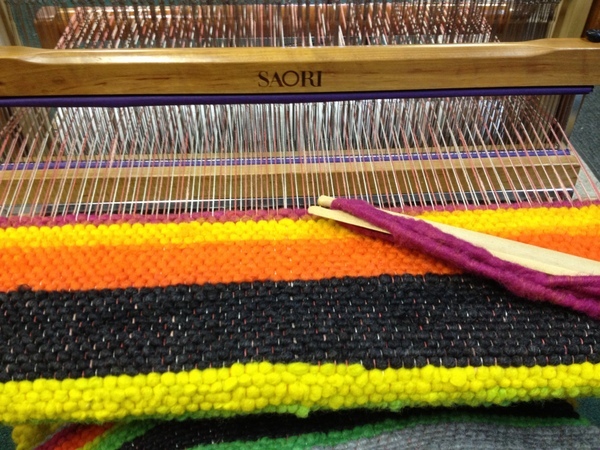 I often had to tighten the warp because I wanted to the weaving tight as possible. 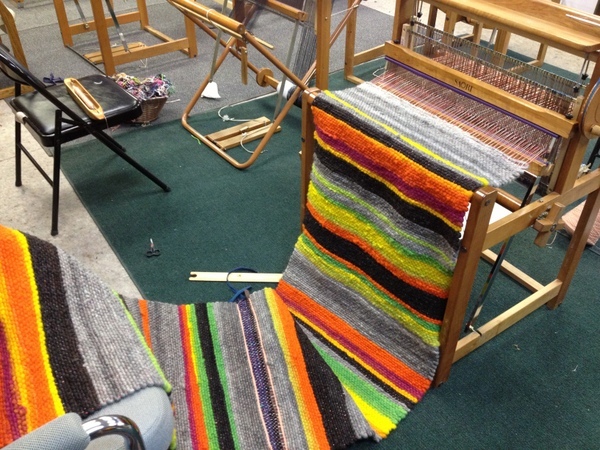 Then I needed to take some woven portion out of the cloth roller when I started second panels because the roller got so thick and could not take all the fabric there. I wove 3 panels (60cm width and 2 meter long each) with the same warp and sew them together by hand with sweater stitches. 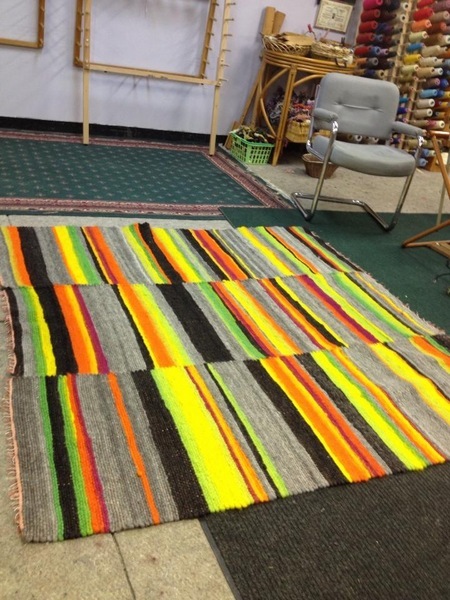 I am pretty happy with the finished rug. The colors are so bright to give me energy during this cold miserable winter. The warmth protect our feet. And I learned my washing machine can take this thick rug and it was not a problem. I washed in cold water for a couple of minutes, rinse it for a couple of minutes, spin it and air dry. It’s so confy! You are welcome to sit at my dining table to check this out anytime!